1 bedroom accommodation in Charlottesville - Ridge St.
Ridge St., Charlottesville, VA, USA0.3 mi to Ridge St. This charming one bedroom carriage house in the heart of downtown Charlottesville offers southern elegance with modern convenience. The second floor loft combines a private, comfortable atmosphere with a desirable location offering easy access to 1-64 and within a mile from both UVA and 1/2 mile from the downtown mall. The second story living space was designed with luxury, comfort and privacy in mind. 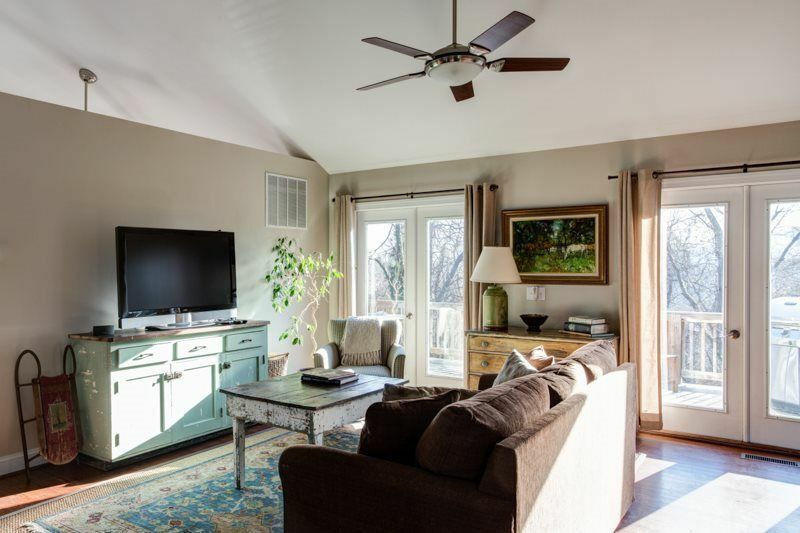 Sitting above an enclosed garage, the carriage house offers a living room, full chef’s kitchen, private bedroom and full bathroom that was renovated in the summer of 2018. The separate bedroom offers high quality bedding with top of the line linens and a gorgeous view of Monticello and Brown’s Mountain. The main living space has a pull-out queen sofa, LCD television with Sonos Soundbar, desk space, and wireless internet. The large chef’s kitchen offers a full size refrigerator and dishwasher, as well as ample counter space for meal preparation. We offer tableware and utensils for you to use at your leisure during your stay. You may also enjoy dining on the back deck or sitting on the outdoor couch and taking in the comfort and relaxing atmosphere as you overlook a private wooded lot. Looking to accommodate MORE GUESTS? Downtown Ridge (listed separately) is located directly in front of the Carriage House and pairs perfectly to sleep up to 10 guests. Give us a call with any questions about renting both! Private Wine Tours | Private Chefs | Event Planning | Concierge Services We are STAY Charlottesville, a vacation property management group that has been providing guests some of the finest homes and estates in Central Virginia since 2011. When choosing one of our homes, you get so much more than just a bed. Our management group specializes in tourism and hospitality in the Charlottesville area, meaning when choosing one of our curated homes, our guests have the ability to get discounted wine tours, private chefs at their home, yoga at the estate, a stocked fridge upon arrival, airport transportation, planning help with their wedding or rehearsal dinner, and numerous other offerings. Our team is here to make sure that we can make your stay more than just a stay. If you have questions about our service, just give us a call! Was very surprised pleasantly surprised. Loved the high ceilings and openness of the property. We loved being able to look out the back doors and look onto the woods and when surprised when we saw deer. Kate from Stay was very helpful with questions about Charlottesville and highly recommend! We are so glad that you enjoyed Downtown Carriage House! Let us know when you're back in Charlottesville; we'd love to have you stay at a STAY Charlottesville property again! This rental was great for the few days that we were in Charlottesville. The bed was comfortable, plenty of hot water for showers, nice kitchen. We especially enjoyed having early morning coffee out on the deck watching the birds! The trees were great cover for them. There were even six deer running through the yard one morning. We enjoy walking and the area was great for that. Friendly neighbors! The manager was quick to help us out when we ran into a problem. Very friendly, very helpful. We were in Charlottesville for a few days to see Monticello and the area, as it was our first time. We found the Carriage House conveniently located and well-appointed with washer/dryer, reliable WiFi, and full kitchen. There were some issues with kitchen appliances that were resolved by contacting the property management, but we were a little disappointed in what appeared to be some deferred maintenance with the property in general. For example, the deck contained a hammock, table & chairs, and grill, but we got the impression that these items had been left outside over the winter since they were very dirty. The inside of the unit was very clean, however. We were able to easily walk to downtown, and also took advantage of the bus stop less than a block away. My 5 day stay at the Carriage House was superb. I thoroughly enjoyed the Carriage House's beautifully decorated loft-style one bedroom apartment. It's kitchen and chic great room with open floor plan and vaulted ceiling is very inviting to spend time reading, watching TV and connecting to the fast internet. The granite appointed kitchen with its conveniences and art work made it a pleasure to use. The roomy bedroom has sliding door access to the secluded deck which is surrounded by high-canopy trees, providing total privacy. The great room also accesses the large deck, allowing you to open both sets of doors for nice breezes, and take advantage of the fresh air. Whole apartment air conditioner was very quiet. Parking my car in the garage below the apartment is a luxury I have not experienced at other cottages. Walking distance to restaurants was nice for exercise as well riding my bike in Charlottesville's town bike lanes and off road trails was perfect for getting around. Not a single complaint. I highly recommend the Carriage House when staying in Charlottesville and will stay again myself during future visits. This was a great place to call home for a couple of days or even longer. We were there for 3 days in September during Family Weekend at UVa. It had everything we needed, including a washer and dryer to do our daughter's dirty laundry!! Very quiet, and a quick drive to anything near downtown Charlottesville or UVa grounds. Will not hesitate to come back again! We are glad to hear your family had such a great weekend in our property, we hope to host you again soon! Great upstairs apartment fairly close to downtown. Not quite walkable. Loved the kitchen and deck. The bedroom was nice and comfortable. Our only complaint was the bathroom was a little dark. The immediate area is just OK. The place was clean and kept up nicely. Ridge St was named for its geographic location in Charlottesville as they have both views of Monticello mountain as well views off to the west of the university. Homes on Ridge St were built back in the early 1900's and were sought after because of the belief that on Ridge St you would find the not only fresh air but a cool breeze.